With his proposal to jail Glenn Greenwald, the New York Republican recalls an ugly tradition of attacking freedom of the press. 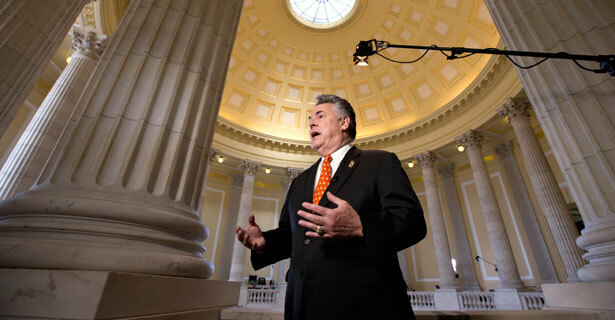 New York Congressman Peter King, with his call for the prosecution of journalist Glenn Greenwald, recalls a long and dishonorable American tradition. The congressman is not satisfied to go after Snowden, the private contractor who has provided a measure of insight regarding the extent to which we live in a surveillance state. King wants at the journalist who dared to tell the people. Growling that “legal action should be taken against [Greenwald],” the Republican chairman of the House Committee on Homeland Security dismissed First Amendment concerns, declaring that “no right is absolute!”—and that includes the First Amendment right of the people to be served by a free press. So King is calling for the “very targeted, very selective” prosecution of journalists for informing the American people about what their government is doing—and why it might be wrong. It was in that year that President John Adams presided over the enactment of the Alien and Sedition Acts in a mad rush to disregard civil liberties and begin jailing his political and journalistic critics. In doing so, Adams and his allies opened what would be a defining debate when it came to the American understanding of the freedom of the press protection in particular and the broader right to challenge the claims of the government. It was an intense time, arguably the most dangerous moment faced by the new nation. Dissenters were accused of threatening the safety and security of the republic. Those who did not meet the approval of Adams and his cronies were punished for sharing information and ideas that provided citizens with dissent from the official line. Vermont Congressman Matthew Lyon was prosecuted and jailed for, among other things, publishing a condemnation of Adams’s “unbounded thirst for ridiculous pomp, foolish adulation, and selfish avarice” in his newspaper The Scourge of Aristocracy and Repository of Important Political Truth. Lyon believed that Adams was steering the United States toward war with France, and he wrote and spoke about the folly of that endeavor. Adams and his allies used the hastily enacted Alien and Sedition Acts to punish what was perceived as malicious writing with regard to the government in general, and Adams in particular. The abuses of basic liberties were so extreme that the sitting vice president, Thomas Jefferson, openly broke with Adams and emerged as the outspoken leader of the opposition. “A little patience, and we shall see the reign of witches pass over, their spells dissolve, and the people, recovering their true sight, restore their government to its true principles,” wrote Jefferson after the passage of the laws that would be used to assault not just freedom of the press but also the right to dissent. Jefferson defeated Adams, securing a victory that would renew the revolutionary “spirit of ’76” and secure—for a time—the promise of the Bill of Rights. In his rant about the current controversy, Peter King said something about crackdowns on a free press being a “certainly very rare” shredding of the Constitution. Actually, it’s not very rare. The conflict over the right of a free press to speak truth to power—and to state truths that power would prefer to keep hidden—has never really ended. It stirred during World War I, when the government sought to run socialist and anarchist newspapers out of business. It stirred in the 1970s, when Richard Nixon’s administration was busy placing the names of journalists on its enemies list—and seeking to thwart the publication of the Pentagon Papers. There have always been Peter Kings—politicians, motivated by “selfish avarice,” who would prosecute and jail those who inform Americans of what is being done in their name but without their informed consent. Tech experts say Glenn Greenwald misinterpreted one of the NSA slides leaked by Edward Snowden. Read Rick Perlstein’s report here.